View More In Floor Puzzles. For globetrotters, everywhere this sturdy 24 piece floor puzzle features vibrant, detailed artwork with plenty of things to spot. Can you find the bear, zebra, whale, or panda? These extra thick and chunky puzzle pieces are just right for toddlers. Contained in a perfect gift-to-go box with a soft cotton rope handle. 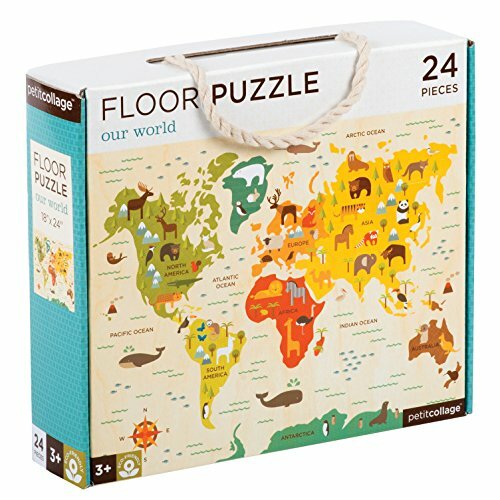 Our floor puzzles are made from recycled cardboard and printed with vegetable inks. Our products are designed with the health of our children, and the planet in mind. Made with recycled paper printed with non-toxic environmentally friendly vegetable based inks. Our products are designed with the health of our children, and the planet, in mind. Meets and exceeds all safety standards. If you have any questions about this product by Petit Collage, contact us by completing and submitting the form below. If you are looking for a specif part number, please include it with your message.